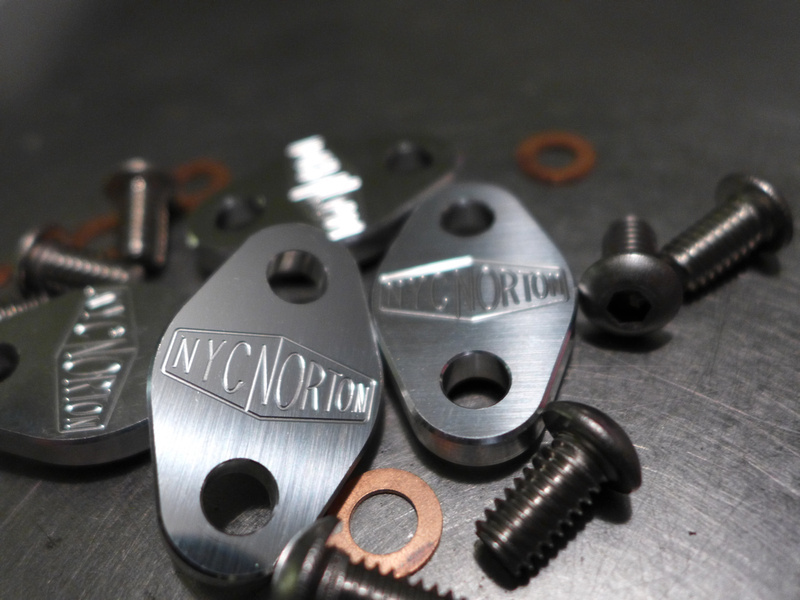 Register Log In Britbike forum Forums Norton bulletin board Stainless rocker plates - One (1) piece type...? 1,557,414 Calling all Dash Y and Y bike owners..
73 registered members (998John), 519 guests, and 827 spiders. So we ordered a bunch of parts for my Buddy Bryan's '73 850 Commando. Received the goods today and checked them all in, mostly good however, I am in need of a sanity check here. According to the Parts manual, What I need are the "Lock Plates and Retainer Plates" along with appropriate gaskets. Now, these plates are real cool but I just need to know whether these are a direct replacement or do I need the two-plate set up...? Oh, another thing, the Stainless plates have a raised boss on the back side, I did not measure it, probably .100" give or take. Support Your #1 BritBike Forum! The 1 piece is replacement for the 2 piece. Well cool. I'll go pull one apart and check it out. I got these some years ago. Been on the bike since, no issues, no troubles. 850 Commando. "It is no measure of health, to be well adjusted to a profoundly sick society." Yessir, just like those, without the engraved logos. Can I rotate the rocker shaft back without any damage...? Looking forward to using these new plates if possible. Yes you can rotate. Use heat gun around area and align it. Interesting. Is this a common occurrence..? What a relief that the cure be that simple. I will do just that. Prior to putting some heat to the valve cover I tried to find a suitable tool in the vast array of tool boxes here, no go. So I am making a tool for turning the rocker spindle using 1/2" square stock, whittling down (I do not have a milling machine) a lug to fit precisely into the slot of the spindle. Wish me luck, don't wanna break anything...! If the engine runs then start it and get it up to temp, the plates are to stop the spindles turning when the head is hot. The 850 is in a non running state at the moment, taking it down for some maintenance and noticed this misalignment. Will I do harm by doing this with the engine cold...? Well, I will heat it slightly with a heat gun. No, but do get some heat into the head using heat gun. I made a tool from mild steel to insert into the rocker spindle and rotate it back into position after applying heat with said heat gun. The simple tool I knew would possibly deform under pressure even with the heat. It did however the spindle is nicely aligned. If I were to make another (Heaven forbid) tool I would have it milled and heat treated so as not to deform, ok, bend. So, the new stainless plates align well for both the bolt holes and the locking device. Thanks much for the advise, you folks are great. Such a helpful community of riders and wrenches.